A new site for the production of gastroenterology and anti-inflammatory medicines via an oral solid dose tablets and capsules form for the local Indian market is due to be in production in Q1 2018. Eight billion tablets and one billion capsules are expected to be produced at full production capacity in any one year period. The manufacture of gastroenterology and anti-inflammatory medicines gives challenges in the operations process in the form of ensuring occupational safety is maintained to allowable levels. Health and safety data for each product involved in the manufacturing process was reviewed and evaluated by Extract Technology and the client to determine that the correct containment solution was implemented. Potent active ingredients used in the process pose the highest risk to operator safety. The process was divided into three elements: sampling, dispensing and coating. During sampling operations, the challenge was to safely handle varying compounds with OEL (Operator Exposure Level) of <1μg/m³ entering the goods-in warehouse. The solution was to design an isolator consisting of an entry airlock, main chamber and exit airlock. The client's risk assessment deemed that the isolator design requirement should be <1μg/m³ due to other factors such as product density, quantity handled and the task duration. The isolator was designed to handle products with high MIE values (minimum ignition energy). Raw material sampling of product with OEL of <100μg/m³ were to be performed in two downflow booths. On instances when sampling of more potent products (<10μg/m³) is required, a 5 dimension rigid barrier screen will be included, providing an additional layer of safety to the operator's breathing zone. The customer provided their own conveyor line through the booth for safely sampling pallets of bulk excipients (sacks or FIBCs). The dispensing operation had two challenges. The first was to allow safe weighing, dispensing and sieving of API (active pharmaceutical ingredient) into a mobile vessel. The second was to safely handle varying bulk ingredients that may carry a sensitizer, caustic or skin inflammation risk to the operator. The bulk ingredients were weighed and dispensed to a specific recipe via the clients recipe management system integrated into the downflow booth. They are then sieved , to remove foreign objects and oversize material, and then dispensed to an IBC or Polybottle. 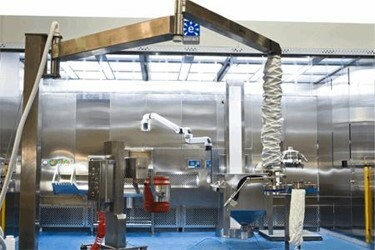 The solution consisted of an isolator with a transfer airlock, main chamber with integrated weighing system and a rapid transfer port to achieve OEL of <1μg/m³. Furthermore a GEA high containment split butterfly valve was integrated into the base of the machine for safe transfer of API to the mobile vessel docked below. A static platform was included to raise the isolator allowing a mobile vessel to dock with a high containment split butterfly valve on the outlet of the isolator. The first downflow booth incorporated sack lifters to assist with manual handling, a weighing bench, weighing hopper and a compact Russel Finex 400 sieve. The second downflow booth was similar but did not require hoists. Here the compact Russel Finex 400 sieve was used to discharge powders into a polybottle. Drum tipping devices were included in the downflow booth to allow partial sacks to be transferred to a lined drum and to tilt drums at angles to allow for easier dispensing. By dispensing at an angle, the operator can avoid reaching deep into the drum thereby keeping his breathing zone a safe distance away from the powder. The challenge for the coating process was not only to provide operator protection, but to control the process so that the water soluble colorant was kept local to the machine. No migration of the colorant from the process was acceptable. An isolator and 6 mobile mixing vessels were supplied to meet this requirement. This equipment was used for the solution preparation to film coat tablets with the water soluble cololrant. When the solution is mixed successfully the vessels are transferred to a bulk storage area or are transferred to a tablet coating machine. 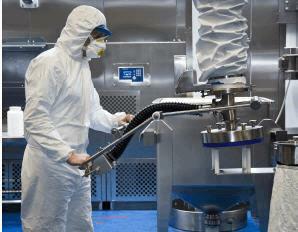 The isolator is used as a solution preparation area to feed the film coating process. The isolator maintains a negative pressure regime to the surrounding environment to ensure all potential contamination is contained within the isolator to achieve an OEL of <1μg/m³. The isolator is used as a solution preparation The isolator is supplied with a manual conveyor to transfer the pre-weighed dry powder bags. Bags are transferred into the isolator main chamber via the loading door. The transferred bags are opened inside the isolator and the powder is discharged into the mixing vessel below through a process valve in the isolator floor. The empty bags are disposed via the bag-out port located on the side of the isolator. 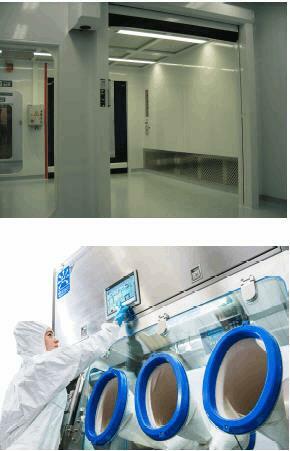 The isolator includes a wash-in-place system controlled by the isolator PLC for cleaning after the process is complete. Two sampling downflow booths with a DEL of <1μg/m³ over an 8hr TWA with opening for client supplied conveying lines and installation of fast acting doors. One custom 3-chamber sampling isolator with a DEL of <1μg/m³ over an 8-hour TWA. One custom 2-chamber dispensing isolator with a DEL of <1μg/m³ over an 8-hour TWA, with outlet to accept GEA high containment valve with extraction ring and compensating docking device for vessel connection. One sack ripping and tipping station with a DEL of <500μg/m³ over an 8-hour TWA with six 200L Gross Mobile Solution Preparation Vessels with agitators. Extract Technology was selected for its proximity the client which allowed the team to provide prompt service response times and􀀃ability to hold consignment spare parts stock. Also Extract Technology provided numerous references for this scale of project. Extract Technology partnered with Palamatic, Russel Finex and GEA to procure various equipment. Extract Technology coordinated and provided a complete solution that involved live product testing with Russell Finex and various control and mechanical design integration meetings between each of the companies. 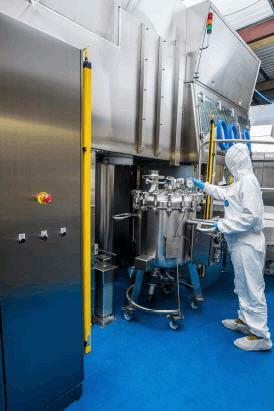 The turnkey package was factory acceptance tested (FAT) at Extract Technology’s facility in Huddersfield, England.